Moroccan Lamb Stuffed Squash | From Scratch Fast - Recipes & meals from scratch for busy cooks! 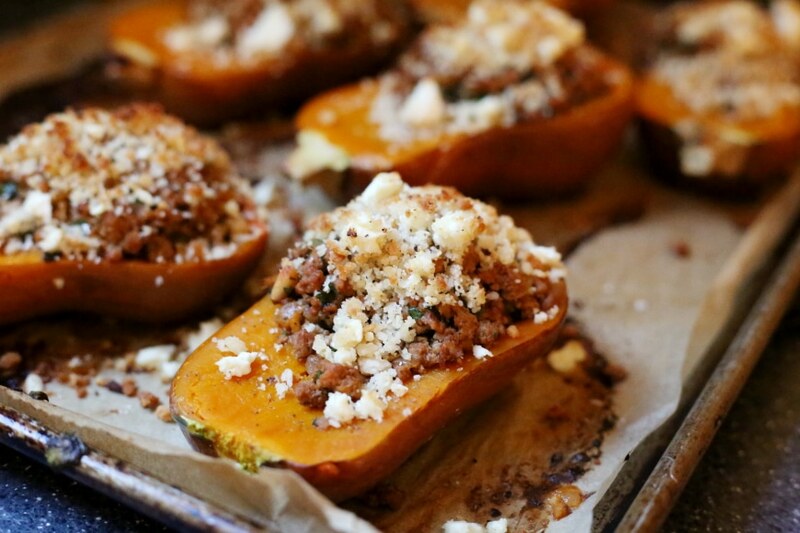 These Moroccan Lamb Stuffed Squash are my new obsession. 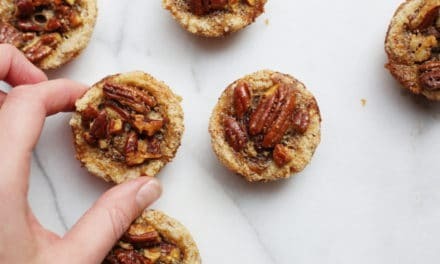 With a succulent lamb filling that’s seasoned with garlic, ginger, cumin, coriander, cinnamon, mint, cilantro and pine nuts, and a crispy brown-butter breadcrumb and feta topping, they embody everything I love about fall—they’re fragrant, comforting and sweet, as fitting on a weeknight table as on a special occasion menu. My mom visits for a week every fall, and for me it’s therapy. Living in New York, we miss out on my family’s birthday parties, get-togethers and barbecues back in Illinois. It’s hard. Luckily, we’re able to see them a few times a year, and my mom comes out in the fall and spring for some serious bonding time. I get a chance to talk to her about everything from love, to raising kids, to how to caulk a bathtub, and my girls get completely spoiled with treats, French braids and scream-out-loud Mimi giggles. She visited us last month, and I decided to make a stew on her first night in town. 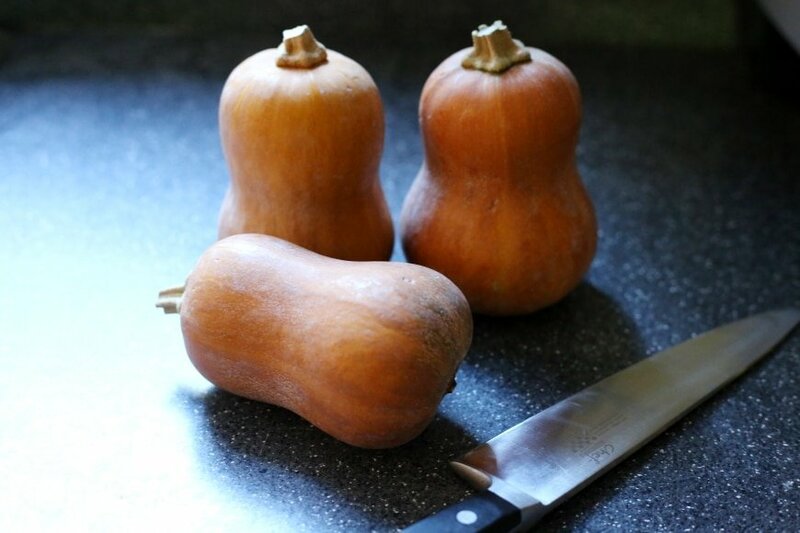 However, when I went to the market I discovered these little buttercup squash and immediately changed course (forget puppies—cute vegetables are what make me gush). They look like mini butternuts and taste even sweeter. (And did I mention that they’re ADORABLE?) If you can’t find them, acorn squash are a great swap. I decided to stuff the squash halves with lamb, an idea I borrowed from my mother-in-law (moms are the BEST). Instead of going the Italian route of my MIL’s recipe, I instead decided to meander towards Morocco, seasoning the browned lamb with cumin, coriander, cinnamon, mint and cilantro. Tomato paste lent depth of flavor, chicken stock prevented the meat from drying out, and pine nuts added a bit of texture. At the last minute, I made a topping of feta cheese and panko breadcrumbs, which I first tossed with brown butter (I might never make breadcrumbs without browned butter again, and you shouldn’t either). The result was a savory, sweet, crispy, and all-around lovely main course that I served with a giant green salad and this apple crisp. 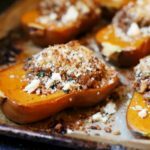 A few weeks after my mom left I made the stuffed squash again, and, while they tasted even more delicious that we remembered, the meal just wasn’t quite the same without her there. But before we knew it we were reminiscing about her visit and laughing over the gazillion Mimi memories that are stored like shiny records in our family collective. That’s the great thing about food. It can make people materialize, even when they’re not there. This Thanksgiving we won’t be with our blood relatives but rather with friends here in the Hudson Valley. While I know we’ll miss Mimi and Grandpa and Gram and Papa and all the brothers and sisters and cousins, I also know that as we sit to eat our turkey and stuffing and mashed potatoes, they won’t feel so far away. I wish you peace and love this Thanksgiving. May your loved ones be close at hand, or at least close at heart. These little buttercup squash are stuffed with a Moroccan-inspired lamb filling that’s seasoned with garlic, ginger, cumin, coriander, cinnamon, mint, cilantro and pine nuts. 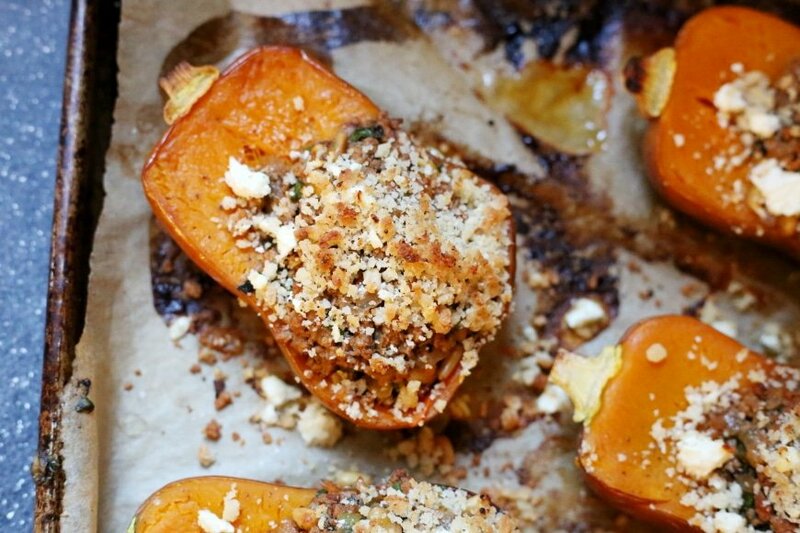 The squash are sprinkled with a crispy brown-butter breadcrumb and feta topping, for a comforting savory and sweet main course that’s as fitting on a weeknight table as on a special occasion menu. The squash can be roasted up to 8 hours in advance and can be stuffed up to 1 hour ahead of time, if you want to get a head start. 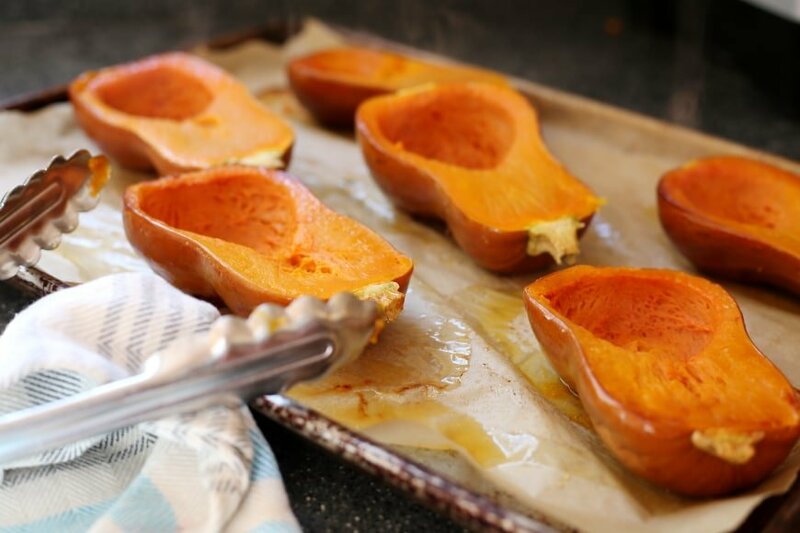 If you can’t find buttercup squash, acorn squash is a fantastic alternative. Preheat the oven to 400˚F. Line a large baking sheet with parchment and spray lightly with cooking spray. Place the squash halves, cut side down, on the baking sheet. 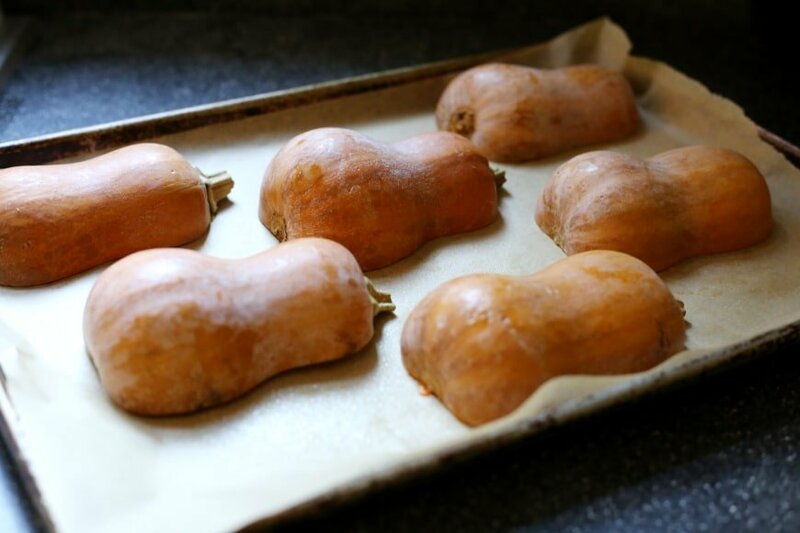 Roast until tender, 25-30 minutes for honeynut squash, or 40-50 minutes for acorn squash. Remove the pan from the oven and flip each squash over so that the cut side is facing up. Set aside. 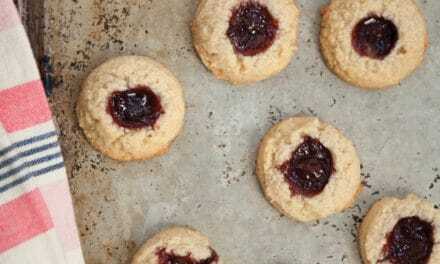 Increase the oven temperature to 550˚F. Do Ahead: The squash can be roasted up to 8 hours in advance. Leave at room temperature. While the squash cooks, make the filling. Heat 1 tablespoon of the olive oil in a large skillet over high heat. Add the lamb, and season with salt and pepper. Cook, stirring and breaking up the meat with a wooden spoon, until browned and cooked through (if the lamb releases a lot of fat while cooking, spoon it off as it cooks). Using a slotted spoon, transfer the meat to a plate and discard the drippings. Heat the remaining 2 tablespoons of olive oil in the same skillet over medium heat. Add the onion, and season with salt and pepper. Cook, stirring occasionally, until tender and lightly browned, about 5-7 minutes. Stir in the garlic, ginger, and tomato paste. Cook, stirring, 1 minute. Sprinkle in the cumin, coriander, cinnamon and cayenne. Stir until fragrant. Pour in the chicken broth and give everything a good stir, scraping up any brown bits from the bottom of the skillet. Bring to a boil. Return the meat to the skillet, and reduce the heat to a simmer. Cook 5 minutes, or until thickened. Remove the pan from the heat, and stir in the pine nuts, mint and cilantro. Taste and season with salt and pepper. Let cool slightly. Melt the butter in a small saucepan. 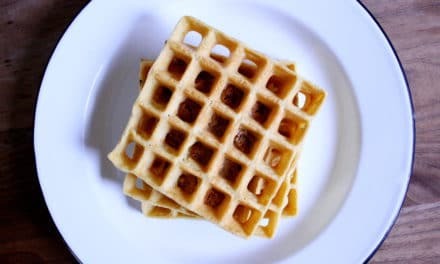 Continue cooking, swirling occasionally, until the butter is golden brown and smells nutty. Pour the butter over the breadcrumbs and toss to combine. Season with salt and pepper, and then fold in the feta. Season the squash halves with salt and pepper. Spoon the meat filling into each squash cavity, mounding it firmly. 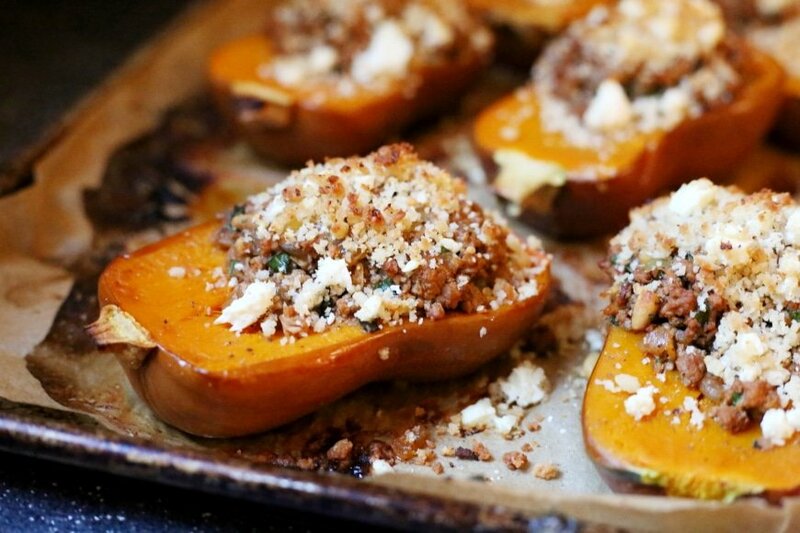 Sprinkle the breadcrumbs over each squash, pressing them to adhere. Do Ahead: The stuffed squash can sit at room temperature for up to 1 hour. Roast the stuffed squash in the 550˚F oven until the top is lightly browned and crisp, about 4-6 minutes. Garnish with additional mint and cilantro before serving.